Two things conspired to create an amazing restoration story, that were it fiction, you’d laugh at the author's attempt to create such a scenario. First, there are many systems that have to be in pretty good shape if you want to fly over the two largest oceans to get home. You need engines you can count on to keep running until you shut them down, the airframe needs to be free of corrosion to keep everything together in the way Mr Boeing designed it and other vitals such as the electrics, the hydraulics and the pressurisation and air conditioning systems all have to function as intended. This is motherhood statement stuff. There is one other, perhaps more vital, system that needs to be equally reliable. The waste water system, aka the toilets. If you can’t go to the loo, life is pretty restricted. It fell to me to ensure the potable water and toilets were serviceable and up to a point that wasn’t too hard. Checking the flow out of all the taps and seeing that the toilet flush functions all worked was not exactly rocket surgery. The last part of this check was to ensure the waste could be dumped into what is affectionately known as the honey cart, the tanker that hooks up to the toilet dump chute with a hose and into which the waste is drained on arrival. The large diameter dump chutes have a cap that closes off the big hole to prevent pressurisation air from escaping and the 707 has two of them. 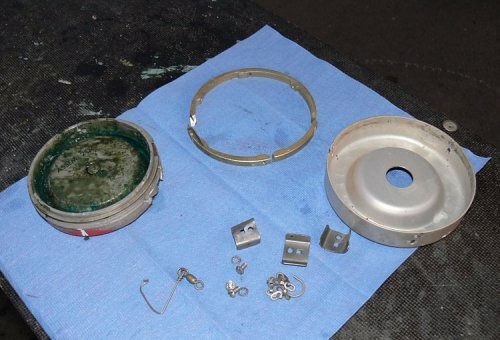 In the functional test routine the fwd cap was easily removed but the aft cap was seized solid. It would not budge despite the combined efforts of three of the sharpest minds on the rescue team. There was no way to remove it in one piece so the decision was made to cut the rim off and remove the locking mechanism with it. Naturally this meant having to source a new cap. Second, one of the terms of the contract of XBA’s sale was that we had to remove all items from the cabin which were gold plated or gold in colour. 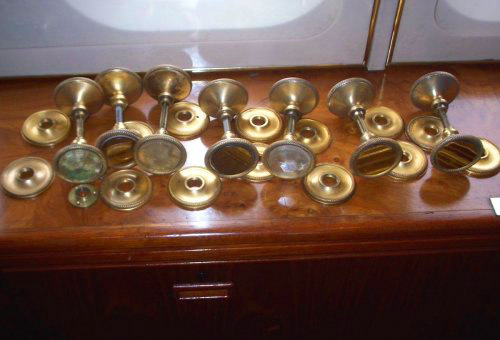 This included ashtrays, seat belt buckles, bathroom and toilet fittings such as taps and even one very gold washbasin. These were not show stoppers but just time consuming tasks that had to be done to comply with the BAE Systems contract for sale. One gold plated item however, presented a problem with its removal. That was the flight deck door handle. Without a handle on that door, entry and exit would not be possible. So there we were, in need of two very diverse components, a toilet dump chute cap and a door handle. As it happened, ours wasn’t the only 707 in the village, there being another cargo version on the airport. This aeroplane had been impounded by Southend Airport authorities due to non-payment of some substantial airport charges. 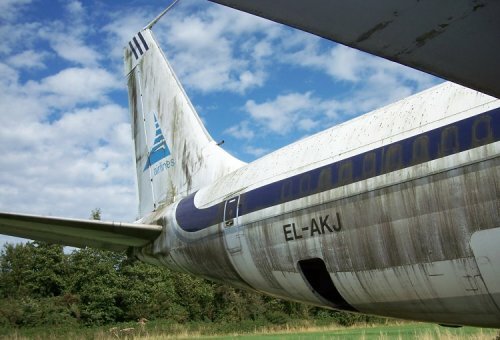 The legal case dragged on for many years and the 707, now a freighter but which was originally a Pan Am aeroplane, lay in limbo awaiting the outcome of the legal wrangle. In the UK, there are quaint regulations that cover access to public paths, covered under basic rights of way laws. In a nutshell, these laws allow people to walk pretty much wherever a “footpath” was drawn on a map. If a path existed before a block of land was developed, then that access was always available. Just as the Lord of the manor is obligated to allow people to walk through his property along these paths, so was Southend Airport required to allow ramblers to walk through the airfield using these historic rights of way. As I said, quaint. It so happened that many years after the defaulting 707 was parked on the airport, ill-meaning people, unchallenged by claiming their right to walk on public paths, were able to walk up to and gain access to the 707 and vandalise it, setting a fire on the flight deck. This naturally destroyed the aeroplane, with the entire flight deck reduced to charred ruins and for good measure, the fire burning a hole through the cockpit roof. 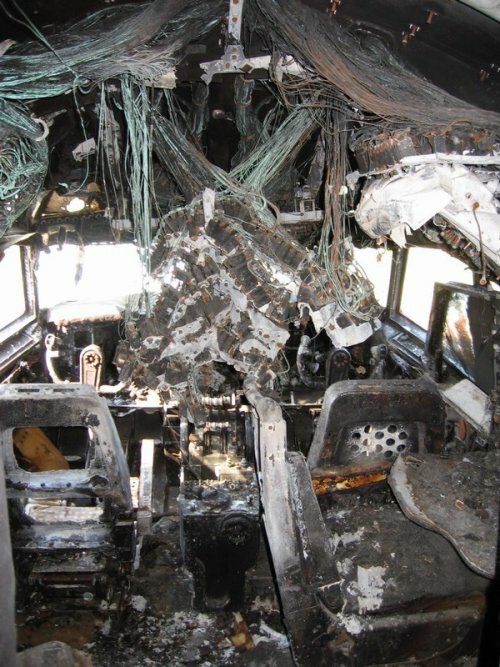 The fire gutted cockpit of the other Southend 707. Ownership of the aeroplane eventually passed to the Southend Airport corporation and through a cordial relationship built between the airport manager and himself, Peter Elliott was given permission to “visit” the wreck whenever he wanted. The abandoned freighter soon became known as Pick ’n Pay Less. So, with our shopping list of a dump chute cap and a door handle, off we drove to the other side of the airport to see if we could source these components from this second 707. Not surprisingly, when we went onboard to look for a door handle, the flight deck door was damaged beyond salvation, everything destroyed by fire. We resolved to have to buy a new handle, as much as that hurt the budget. The next task was to find a dump chute cap. The easier cap to borrow was the forward one, accessible without steps. Opening the panel to that cap revealed it had already been souvenired. Not to worry, there was another chance, at the aft position. I drove our rented station wagon to the rear of the aeroplane and reversed it under the dump chute panel so I could stand on the rear load area of the car in order to reach the hoped-for aft cap. Stretching on my tip toes, I unlatched the access panel and lo and behold, that cap was still there. Stretching even more, I grasped the cap and strained to twist it to release the locking mechanism. It proved difficult because, don’t forget this was a freighter aeroplane and there was never a need to dump the aft toilets because they were removed for the cargo role. It was probably 10 years or more since this cap had been off. So, summoning extra strength, I again grasped the cap, fighting it until finally, with a satisfying click, it came loose but with me pretty much hanging off it. As it unlocked, immediately the cap came away from the chute and I overbalanced and stumbled from the back of the wagon. As I did so, I heard something hitting the roof of the wagon but with a noise that wasn’t what you might have expected. It wasn’t soft or squishy, but hard and metallic. I sensed that whatever it was that fell had rolled under the car, so on my knees, I looked between the wheels and saw what still makes me grin from ear to ear. There, on the ground under the car, having lain in the toilet dump chute for over a decade was a set of door handles - two knobs, the square drive that joined them and the two escutcheon plates to make up a complete assembly. As I said at the beginning, you couldn’t dream that up if you were a fiction writer. Truly, an amazing moment. All photographs by the author unless stated otherwise.